A trip to Wudang Mountains can be preceded or followed by side trips into other parts of Hubei province, which will be a journey into the heart of China as well as into a time when the place was known as the Kingdom of Chu. 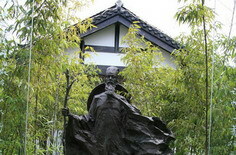 Chu produced the tragic figure of Qu Yuan, poet extraordinaire and a failed statesman who drowned himself when his Cassandra-like warning went unheeded. 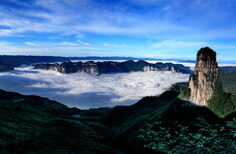 Yichang, south of Wudang Mountains, was Qu Yuan's hometown. Fast forward to the Three Kingdoms era, we have the debonair and strategically brilliant prime minister of Zhuge Liang, the ultimate epitome of wisdom. Old Longzhong in the neighboring city of Xiangyang has recreated, supposedly on the same spots, structures for all the legends such as when Zhuge received three visits from the lord whom he later served. This moss-covered park is good for a stroll and a brush-up of your Chinese History 101. But mind you, there are many places across the country that claim a piece of Zhuge Liang. Jingzhou, to the east of Xiangyang and Yichang, is known to most Chinese as the city that was lost by Guan Yu, one of Zhuge's generals. Guan launched an attack against Cao Cao, temporarily vacating the city of Jingzhou that he was assigned to protect. Sun Quan, the one-time partner, took advantage and occupied it. Now, this has become a mildly chiding idiom for recklessness. Parts of the city walls still exist and you can ramble on it and gaze across the river to see a new city rise up. Moving further east, you will arrive in Wuhan, the provincial capital and a bustling metropolis. 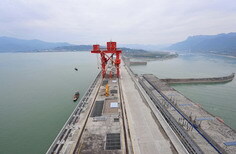 A must-see is Yellow Crane Tower by the Yangtze River. In one of the galleries you'll find that while the tower got its first incarnation in AD 223 it has been rebuilt many times, each with a different configuration. The current one sprang up in 1981, but did not occupy the exact spot as previous ones because it had to make way for the railroad. Underneath the ancient facade is steel and concrete that will hold it against hazards like fire or earthquake. Gone is the ancient celestial Riding the yellow crane away. Here is the Yellow Crane Tower Left vacant and stay. On and on and aimless they remain. Are the grasses on Parrot Isle. The sun has set, and where is my place native? Misty waves on the stream make me plaintive.